A large number of Bills were passed and became law during the last decade in the same manner following the procedure which has been followed in respect of the Value Added Tax (Amendment) Bill, although the latter had been treated differently, Prime Minister Ranil Wickremesinghe said yesterday. He also requested Speaker Karu Jayasuriya to discuss with party leaders and deliver a ruling on those laws passed and Parliament could follow one procedure in the future in moving a Bill before Parliament. The Prime Minister also said it was the responsibility of the Speaker to decide if the standing orders have been followed by Parliament while Parliament also has the power to suspend its standing orders as well. The Premier made these observations after the Speaker made his announcement on the Supreme Court order on the Value Added Tax (Amendment) Bill. He said that in reference to the judgement of the Supreme Court order, the government will table the Bill in the House later. “There are a large number of Bills which have become law in Parliament, last Parliament and the Parliament before, following the procedure which has been followed in respect of the Value Added Tax (Amendment) Bill,” the Premier said. According to the law, when a law is passed, the Court cannot question it. He added that but the members actually go before Court and file a fundamental rights application and question of the non-collection of tax and misuse of the tax money under Bills passed in the last Parliament and the Parliament before. Prime Minister Wickremesinghe said the Speaker should discuss this matter with party leaders and give ruling in a manner that Parliament could follow in the future. According to provision 152 of the Constitution and the 133 of the standing orders, a minister has to get Cabinet approval before the Bill is moved and has to express that he has obtained approval, the Prime Minister said. He said however, during the last 10 years, previous ministers did not follow the tradition of informing Parliament that Cabinet approval had been obtained to pass the Bill. Since 1993, when the President initiated to act as the Finance Minister this had not been practiced, the Prime Minister said. He added that it was the responsibility of the Speaker to decide if the standing orders have been followed and his decision is final. “On the other hand, Parliament has the power to suspend any standing order,” the Premier said. “According to the 135 standing order, we could have suspended the standing order 133 had this matter brought before Parliament before it was taken before Courts. However, we have missed one of the Parliament rights,” he said. The Prime Minister said the Supreme Court decision contravenes a previous ruling by late Speaker Anura Bandaranaike. “This is a matter that comes within Parliament. Leave this matter but the Speaker should give ruling on the laws passed in the past and Parliament would be able to act accordingly in the future,” the Premier said. “On the other hand, we don’t need to give special powers to the Supreme Court as the basic judicial power is vested in Parliament”. 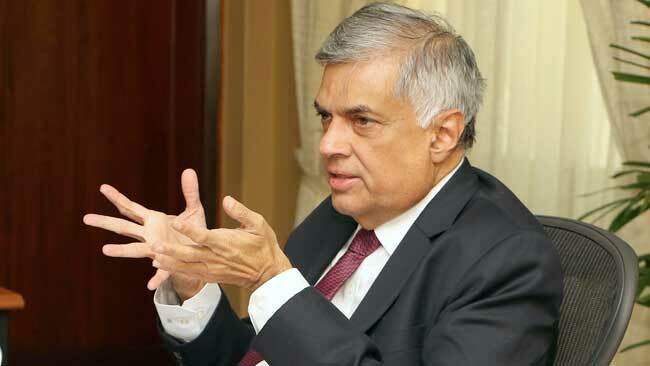 “We will not sack the Chief Justice or bring an impeachment motion against him because the court did not give us a favourable ruling,” Premier Wickremesinghe said. “We have respected the judgments of the Supreme Court. We would correct our flaws. Even now you can bring an impeachment against former President Mahinda Rajapaksa for his acts that breached the provisions of the Constitution”. Ranil's argument is not valid ! We changed the government because MR did things wrong. Therefore Ranil should not have followed those same wrong procedures. He and Ravi should know better! The laws of the country now has to be followed whether it is the Finance Minister or not!